Chinese lanterns are an inexpensive way to add both light and a fun festive element to a celebration. And now that individual battery operated lanterns are available, they can be hung anywhere. 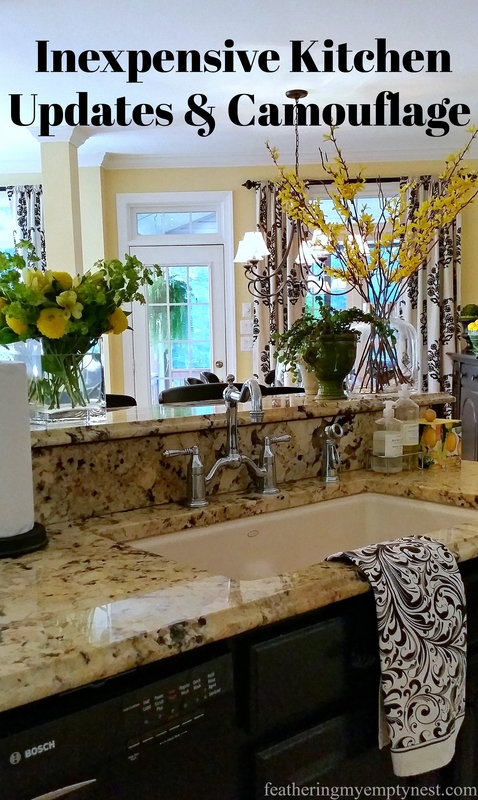 However, finding them decorated and in your particular color scheme is a bit more difficult. I wanted white lanterns with green flowers for my Dum Sum On The Deck Tablescape so, I decided to make my own. I purchased a set of six lanterns on sale from Michaels and proceeded to embellish them. The first step was to hand draw branches with a brown artist felt tip marker all around the globe as if they were growing out of the bottom of and up towards the top. 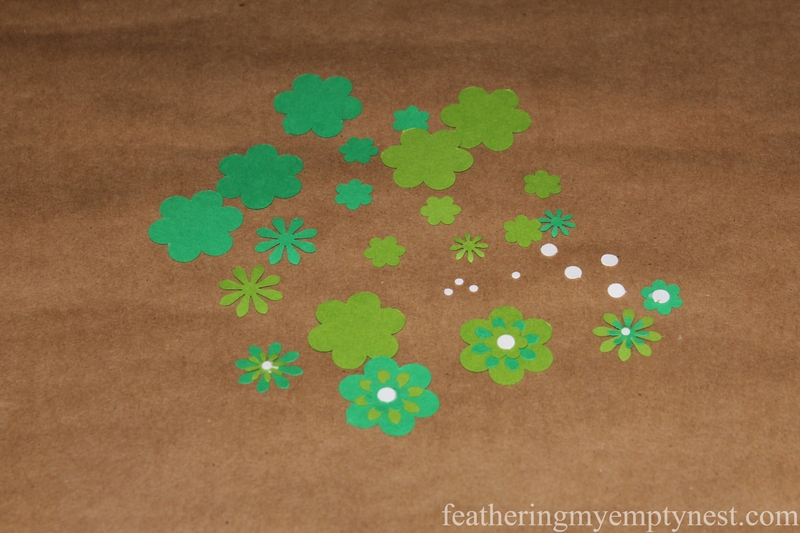 Using two different colors of green scrapbook paper, I cut out a variety of flowers with paper punches that I bought years ago when my kids were little and we were doing a lot of crafts. I also used one sheet of white craft paper to create centers for the flowers with two different sized hole punches. I put the different sized and colored flower cutouts together with white glue. 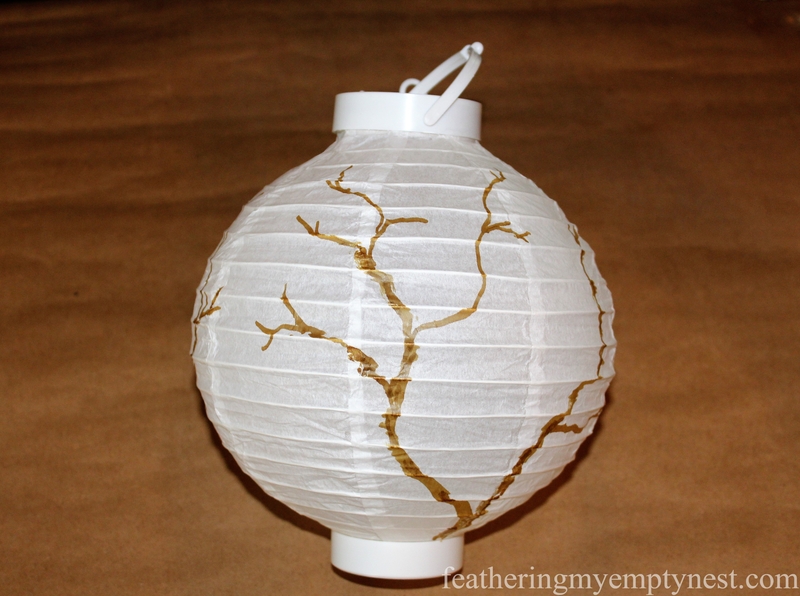 After I made all of the blossoms, I used the glue to adhere them to the lanterns along the branches. 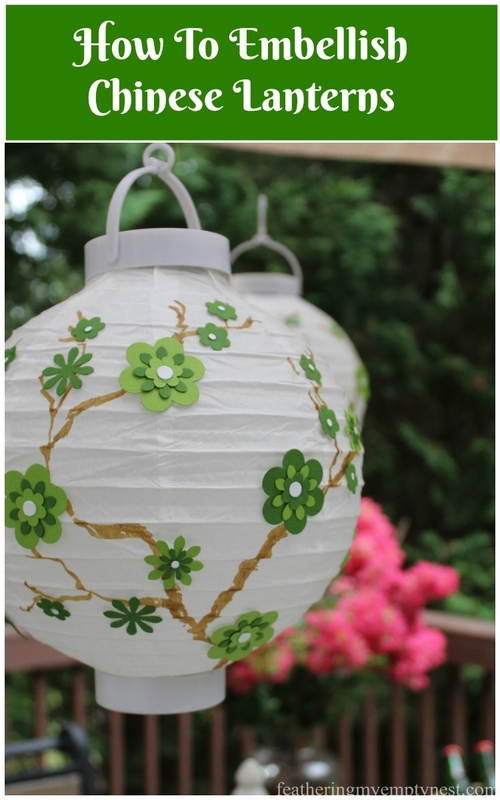 This is a simple project if a bit time consuming, but it is a great way to customize lanterns to your party decor. If you don’t want to take the time to cut out all of the flowers, you could also purchase artificial blooms, stickers, or even use bits of colored tissue paper instead. Oh My Golly, those are fantabulous! I never would have thought of that. I just bought clearance 4th of July lanterns and can hardly wait to embellish them! Love it! Thanks so much for your comment on my post. I really appreciate it. 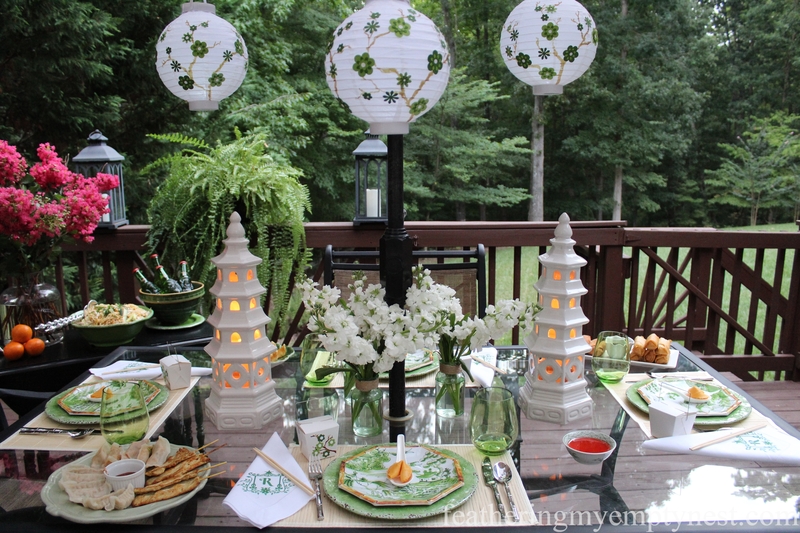 What a pretty outdoor tablescape and such a creative lantern project too! Thanks for visiting my blog and commenting a while back. Your comment landed in a hidden folder on Blogger and I just now found it. Thanks for stopping by! Thanks so much for taking the time to comment. I very much appreciate it. 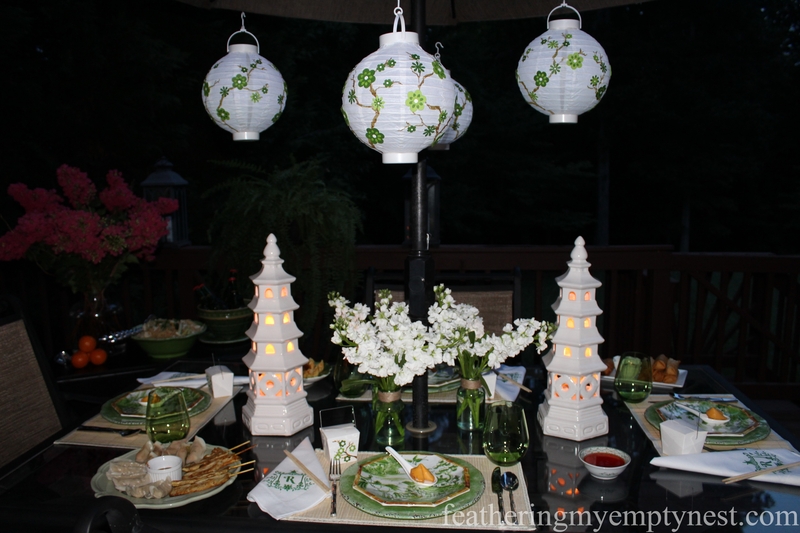 Great idea and way to personalize the lanterns to the theme! Visiting from Share Your Style party. Thanks so much for your comment and thanks for joining our Share Your Style Party. Your lanterns are fantastic, love how you made something plain so pretty with some time and supplies. Very ingenious. 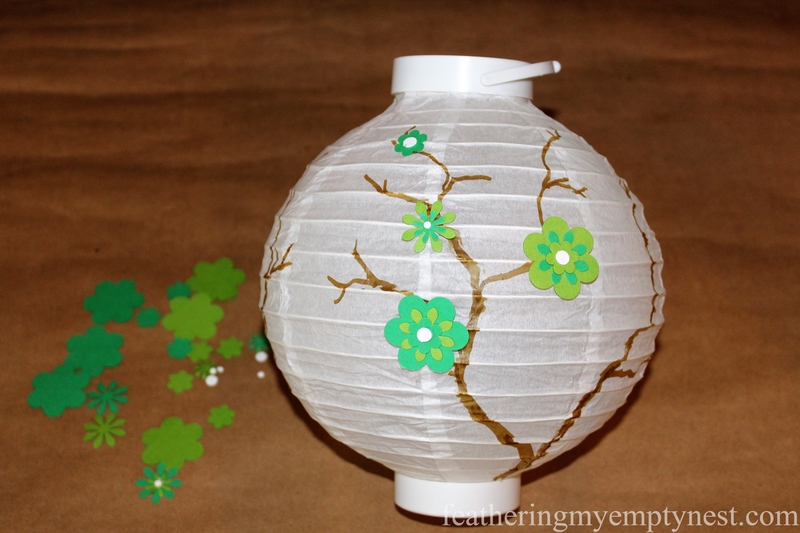 Have inspired me to make pretty paper lantern for our grand daughter. Printing this post so I don’t forget. Thanks so much for taking the time to comment. I think that embellishing a lantern for a child’s room is a great idea. I know your granddaughter will love it. 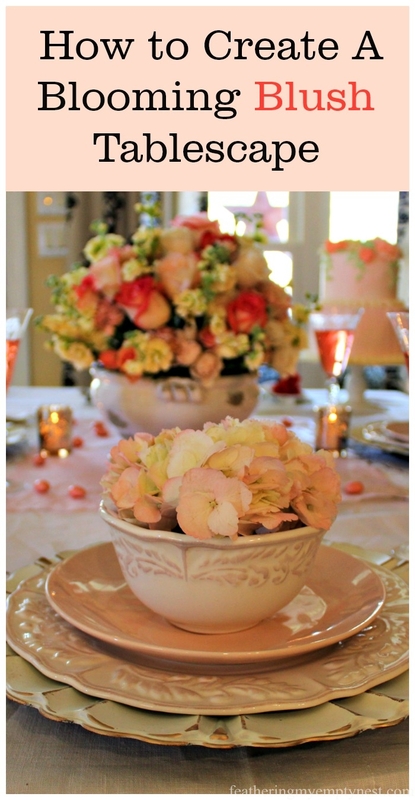 Beautiful tablescape and a clever transformation of plain paper lanterns. I’m not as artistic as you are, but I think I can adapt this to my skill level. Thanks for sharing! Thanks so much. The lanterns were a fun project. I very much appreciate you taking the time to comment. Thanks so much and thanks for taking the time to comment. I really appreciate it. What a great idea…they are beautiful! Thank you very much for taking the time to comment. I really appreciate it. The lanterns turned out so nice. What a great idea! Thank you for sharing this at Party in Your PJs! So simple and yet so spectacular. Thanks for sharing. Thanks so much for taking the time to comment. I really appreciate it. Very cute. They are looking perfect now 🙂 Great DIY. Thanks so much for commenting. I really appreciate it. Thank you so much for your comment and for the invite to Reader Tip Tuesday. I will definitely stop by. Lisa I love this idea. It is so easy to do and has such a great look to it. Pinning! Thanks so much Mary. 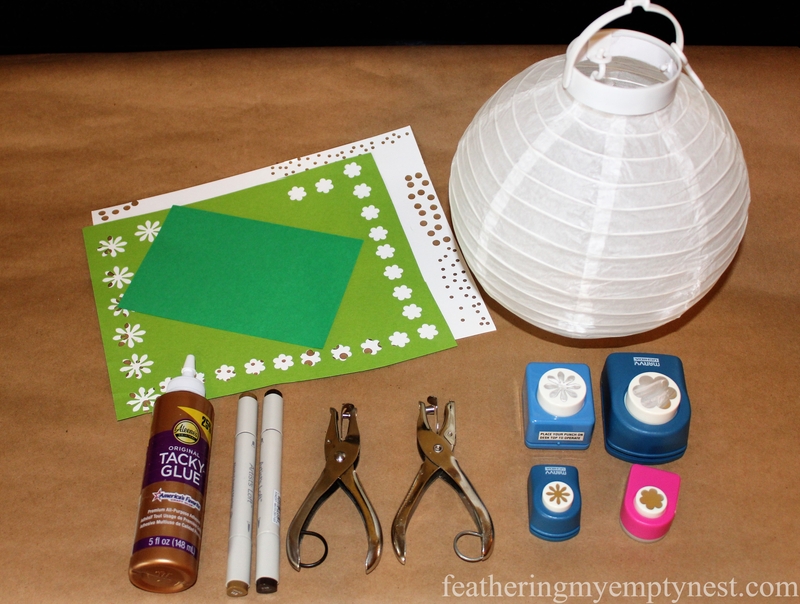 These battery powered lanterns are really neat but as you point out, embellishing them is easy and allows you to take them to the next level. 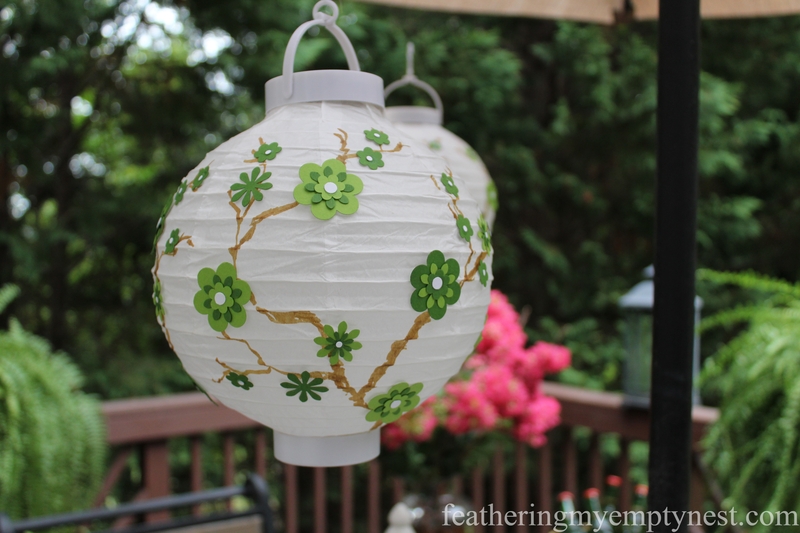 Thanks so much for featuring my Chinese Lantern post. I really appreciate it!